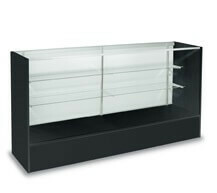 Black Full Vision Display Case 60 inches wide gives you plenty of viewing possibilities for your valuable merchandise. This glass display case comes with tempered glass on the top and front with wood trim and a base. Wooden sliding doors are on the back of this floor fixture to give your employees easy access to the products on exhibit. Adjustable sliding glass shelves come in two measurements, giving you a chance to include more items with a staggered setup of the shelves. 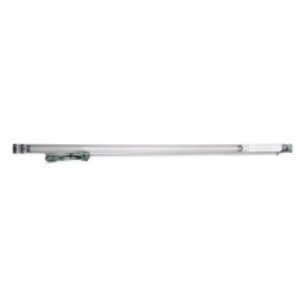 If you are wanting to add a little light on the subject, don't forget to add the optional LED Light. Include a little retail style in your store. Order your full vision counter to your showcasing floor today!